The most popular Banff horseback ride follows beside the very river that has sculpted and shaped the Bow Valley since the last ice age. Its turquoise glacial waters twist through and around an ecosystem unique to this area while the surrounding mountains provide vibrant and endless vistas. This is the Banff Trail Riders’ Bow River Ride. The one hour ride is our most popular adventure, and also our most accessible one, and it’s found right at our doorstep. Starting at our Warner Stables in Banff, a place that has a historical presence itself with the establishment of Banff’s only and one of North America’s largest horse outfitters, this trip will take you through a wetland ecosystem unique to this area, past the Cave and Basin National Historic Site (where Banff and Canada’s National Park system was founded) and along the Bow River itself. Spotting wildlife is very common as this area is a favourite among birds, beavers, elk, deer, muskrats, and more. Overwhelm your senses with us while the flora, fauna, and sounds of wildlife come from every direction in our protected playground that is Canada’s first National Park. Our Banff Bow River Horseback Ride is popular for many reasons but what most guests don’t expect, is the diversity in the ecosystems of this area. You won’t find another place like it in Banff. This is partly due to the hot spring waters from the Cave and Basin percolating the soft ground below – it’s also because of the flat lands capturing meltwater and providing a haven for grass, bush, and water-dwelling birds like cranes, ducks, and geese. 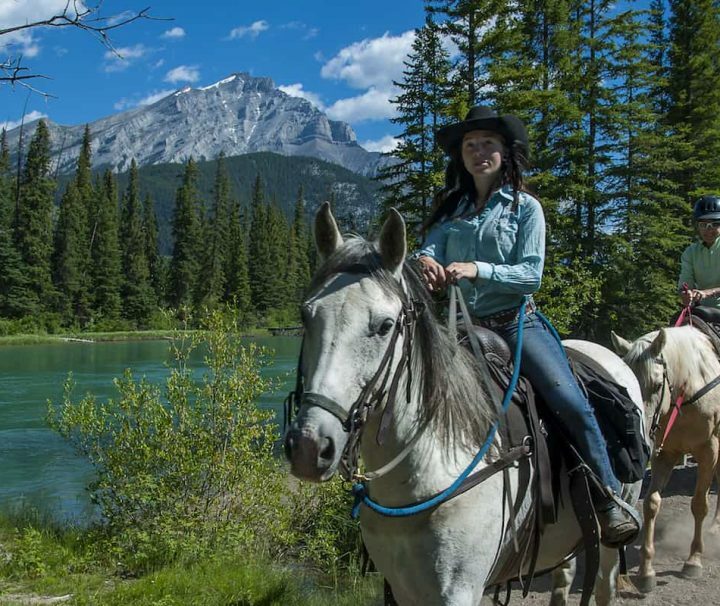 Under the Rocky Mountain sky, listen to the many sounds that populate the area – it’s alive, flourishing, and waiting to be explored on our Banff Horseback Rides. 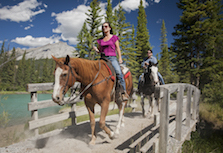 This trail ride may be just what you need to fix that urge for a western-style experience – but if you’re yearning for more, be sure to check out any of our other horseback adventures ranging from longer Banff horseback trail rides to multi-day horseback riding vacations.